Coca-Cola has apologized to an Edmonton family after an unacceptable message was found underneath the cap of one of its drinks. 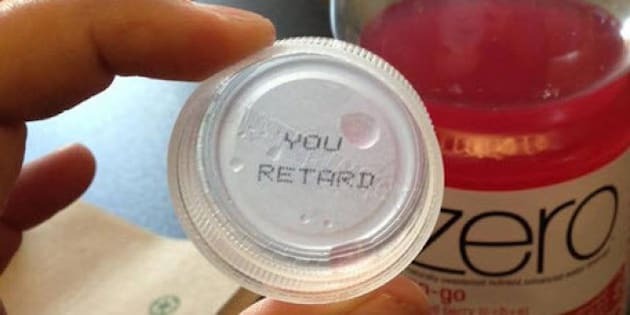 Blake Loates was shocked to find the words "YOU RETARD" printed inside the cap of a Vitamin Water bottle while out for dinner with her husband Tuesday night. "We immediately thought 'You have got to be kidding me,'" she told the Huffington Post Alberta. "We thought it might have been a disgruntled employee or someone in a (bottling) plant playing a joke." Her father, Doug, was equally shocked at the message, considering his younger daughter Fiona has cerebral palsy and autism. "My dad had taught our family what an awful word the 'r-word' is. So he was really upset about this." Doug, who lives in Washington state, stayed up all night penning a letter to Coke. "You see,the "R" word is considered a swear word in our family. We don't use it. We don't tolerate others using it around us. We ARE over-sensitive but you would be too if you had Fiona for a daughter!" Blake says Coke contacted her family Wednesday to explain the bottle cap is part of a contest being held by Vitamin Water where they randomly print one English word and one French word on their caps. "We did not mean to offend at all," Shannon Denny, director of brand communications for Coca-Cola Refreshment Canada, told Metro Calgary. "We are certainly very apologetic for this oversight." "When you look at the same word in English, it takes an offensive connotation," Denny explained. Retard in French translates to "late" or "delayed." "Coke told us they reviewed the words before the contest, so we're still a bit confused about why, after sitting down and looking at the word list, they would decide to keep it. It's English meaning is offensive and they should have realized that," said Blake. The company, however, is working to make things right. Blake was told Coke plans to suspend the promotion and that all the remaining caps have been destroyed. She was also told Coca-Cola will recall any remaining related products. "Our family feels like the 'Little Engine That Could,'" said Blake, adding a photo posted to her Facebook page of the bottle cap has gone viral with hundreds of shares and messages of support. "We're just really glad we're getting a chance to let people know how hurtful the 'r-word' is."